Base of Operations: Unrevealed location on "Earth-22519"
(Fantastic Four III 2001 Annual (fb) - BTS) - The Law Enforcement Squad became their world's mightiest heroes and made enemies of the U-Foes. (Fantastic Four III#46 (fb)) - Shortly after Earth-1462's Galactus skull fell to Earth-616, the Law Enforcement Squad were transported from their own reality to Earth-616 by a reality anomaly caused by Earth-616's Abraxas' impending arrival on the planet Earth. (Fantastic Four III 2001 Annual) - The Law Enforcement Squad's Hulk witnessed Earth-616's Fantastic Four investigating the severed Galactus head. Thinking they were the U-Foes of his own Earth, the Hulk attacked the Fantastic Four's Thing. The other Fantastic Four rushed to Thing's defense but when Mr. Fantastic attempted to reason with whom he thought was Bruce Banner, the Hulk was confused at being called Bruce and began to think perhaps there was a misunderstanding, at which point the Thing bashed the Hulk in the head. The Invisible Woman then surrounded the Hulk's head with an invisible force field and when the Hulk was warned to either calm down or lose oxygen, the Hulk complied. He then asked that the force field be released then leapt off, explaining that the Fantastic Four warranted further study. 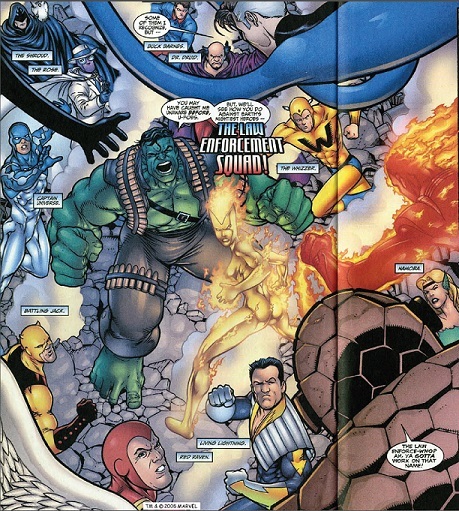 After the Fantastic Four also ran into an alternate reality counterpart of Nova (Frankie Raye) and she escaped, the Hulk gathered the entire Law Enforcement Squad just as Nova arrived to attack them. Having tracked Nova to that location, Earth-616's Fantastic Four battled the Law Enforcement Squad until Mr. Fantastic pleaded for Dr. Druid and Captain Universe to read his mind and learn the Fantastic Four's heroic nature. Captain Universe was shortly thereafter hit with a flame blast from the Human Torch and Doctor Druid ordered the Law Enforcement Squad to halt the fighting. Determined to learn the cause of the misunderstanding, Doctor Druid and Earth-616's Mr. Fantastic opted to venture inside the universe itself by using Captain Universe as a vessel. Inside, the two heroes were met by Abraxas, who was surrounded by Galactus carcasses. Upon their return to Earth-616, Doctor Druid and the other Law Enforcement Squad vanished, presumably returned to their own reality. Comments: Created by Carlos Pacheco, Jeph Loeb, Rafael Marin, Kevin Maguire and Wade von Grawbadger. 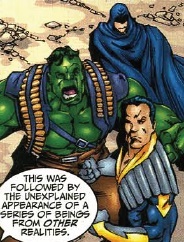 The Law Enforcement Squad's Hulk was not Bruce Banner, as Hulk was confused when the Fantastic Four called him Bruce. It was never revealed who he really was. Also, despite the yellow "Daredevil" costume that Battling Jack wore, it was not stated if he was Matt Murdock behind the mask. Given his choice of codenames, Battling Jack could have been Jack Murdock, who possibly became a super hero instead of Matt. Then again, it could have been Matt, who took his father's name boxing name as his codename. On Earth-616, the Law Enforcement Squad's Hulk continually thought Earth-616's Fantastic Four were the U-Foes, suggesting that in the Law Enforcement Squad's reality, Reed, Sue, Johnny and Ben had become the villainous U-Foes instead of heroes. 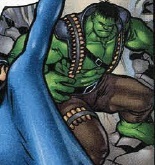 Then again, Hulk could have just been mistaken. The Law Enforcement Squad's Earth was never given a core continuum designation, although Snood suggested "Earth-22519." Buck Barnes was similar to his Earth-616 counterpart, Bucky, except for his being a member of the Law Enforcement Squad. During the Law Enforcement Squad's skirmish with the Fantastic Four on Earth-616, Buck prepared to take down Namorita, who asked if Buck should be dead. Confused, Buck replied no and was then punched in the face by Namorita, who exclaimed that Buck should be. After the Law Enforcement Squad's Dr. Druid and Earth-616's Mr. Fantastic were briefly shown the cosmic Abraxas, Buck and the other Law Enforcement Squad members vanished. Buck Barnes did not display any superhuman powers but was a skilled fighter. Battling Jack was similar in appearance to his Earth-616 counterpart, Daredevil. He was transported to Earth-616 alongside the other members of the Law Enforcement Squad and participated in the battle against Earth-616's Fantastic Four, where he managed to turn the Thing's size against him. The fight was eventually broken up by the Law Enforcement Squad's Doctor Druid before the Law Enforcement Squad vanished from Earth-616. Battling Jack did not display any superhuman abilities but was an extremely skilled fighter, using wrestling maneuvers. Captain Universe was similar to the uni-powered heroes of Earth-616, who had become Captain Universe. The Law Enforcement Squad's Captain Universe was transported to Earth-616 alongside his teammates and battled Earth-616's Fantastic Four before Mr. Fantastic pleaded with Captain Universe and Doctor Druid to read his mind and learn the FF were not the Law Enforcement Squad's enemies. Captain Universe began sensing Mr. Fantastic's heroic nature before the Human Torch blasted Captain Universe with a flame blast, causing the uni-power to leave Captain Universe and float into the air. Doctor Druid and Mr. 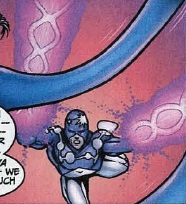 Fantastic then entered the uni-power itself, where Captain Universe directed them to Abraxas, who was surrounded by the carcasses of various reality versions of Galactus. Upon Druid and Mr. Fantastic's return, Captain Universe and the other Law Enforcement Squad members vanished from Earth-616. Captain Universe possessed many of the same powers as the Earth-616 wielders of the uni-power possessed, including flight, energy projection and telepathy. Doctor Druid was similar to his Earth-616 counterpart and appeared to be the leader of his Earth's Law Enforcement Squad. After being transported to Earth-616, Doctor Druid participated in the fight against Earth-616's Fantastic Four, battling Mr. Fantastic until Mr. Fantastic pleaded for Druid and the Law Enforcement Squad's Captain Universe to read his mind and learn that the FF were not enemies. Upon doing so, Dr. Druid learned the truth and ordered the rest of the Law Enforcement Squad to call off the fight. Shortly thereafter, both he and Mr. Fantastic entered the universe itself via Captain Universe's uni-power and learned of the cosmic Abraxas. Despite being ready to aid the Fantastic Four against Abraxas, Dr. Druid and the Law Enforcement Squad vanished from Earth-616. Dr. Druid possessed the same mystic abilities that his Earth-616 counterpart had. Hulk was the first of the Law Enforcement Squad to be unknowingly transported to Earth-616, where he saw Earth-616's Fantastic Four investigated a severed Galactus head. Thinking they were the U-Foes, the Hulk attacked but was subdued when the Invisible Woman placed an invisible force field around Hulk's head. Agreeing to halt the fight and confused as to why the Fantastic Four referred to him as Bruce Banner, the Hulk left, claiming that more study needed to be made. Later, after an alternate reality Nova (Frankie Raye) escaped the Fantastic Four's custody, she attacked Hulk and the entire Law Enforcement Squad. When the Fantastic Four arrived seeking Nova, a fight ensued, with the Hulk still thinking the Fantastic Four were the U-Foes. After Dr Druid discerned the Fantastic Four's heroic nature, he ordered the Hulk to call off the rest of the Law Enforcement Squad while Druid and Mr. Fantastic enter the universe itself via Captain Universe's uni-power in an attempt to learn the cause of their transportation to Earth-616. Upon Druid and Mr. Fantastic's return, Hulk and the other Law Enforcement Squad members vanished. Hulk had the same superhuman strength and durability that his Earth-616 counterpart had. Living Lightning was much the same as his Earth-616 counterpart with the exception of being a member of the Law Enforcement Squad. Upon being transported to Earth-616, he joined the other Law Enforcement Squad members in attacking the Fantastic Four, zapping the Thing with electricity before turning the Thing over to Battling Jack. After Dr. Druid learned the Fantastic Four's heroic nature and learned of the cosmic Abraxas, Living Lightning and the other Law Enforcement Squad members vanished. Living Lightning had the same electricity-manipulating powers that his Earth-616 counterpart had. Namora was similar to her Earth-616 counterpart except for being a member of the Law Enforcement Squad. Upon being transported to Earth-616, she participated in an attack on the Fantastic Four, regarding their ally Namorita as a usurper of Namora's name. Savagely attacking Namorita, Namora was soon met by the Invisible Woman, who suggested to Namorita that they switch fighting partners. The fight ended when Dr. Druid learned of the Fantastic Four's heroic nature and upon his learning of the cosmic Abraxas, Namorita and the other Law Enforcement Squad members vanished from Earth-616. Namora possessed the same superhuman strength and durability that her Earth-616 counterpart had. Red Raven was much the same as his Earth-616 counterpart, other than being a member of the Law Enforcement Squad. Upon being transported to Earth-616, Red Raven joined in the attack on the Fantastic Four, viciously hitting Namorita with his mace before turning his attention toward the alternate reality Nova who was also present. Red Raven managed to absorb Nova's energies into his mace until the Human Torch attempted to calm Nova down. After Dr. Druid learned of the Fantastic Four's heroic nature and also learned of the cosmic Abraxas, Red Raven and the other Law Enforcement Squad members vanished from Earth-616. Red Raven possessed the same wings that his Earth-616 counterpart had. He also carried a mace of unrevealed origins that could absorb energy. The Rose was similar to his Earth-616 counterpart with the major exception being that he was a costumed crime-fighter. As a member of the Law Enforcement Squad, the Rose was transported to Earth-616 alongside his teammates and joined in the attack on the Fantastic Four, where he used a ring-firing gun to constrict the stretching Mr. Fantastic. Namorita soon focused her attack on the Rose before Doctor Druid called off the fight, having learned of the Fantastic Four's heroic nature. After Druid and Mr. Fantastic learned of the cosmic Abraxas, the Rose and the other Law Enforcement Squad vanished from Earth-616. The Rose did not appear to possess any superhuman powers but he carried firearms, one of which was capable of projecting miniature rings that could expand to envelope an enemy then contract to constrict their movement. The Shroud was the same as his Earth-616 counterpart except for his membership in the Law Enforcement Squad. Along with his Law Enforcement Squad teammates, the Shroud was transported to Earth-616, where he battled the Fantastic Four. 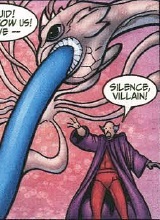 The Shroud tried to envelope the Invisible Woman within the Darkforce Dimension but halted his attack after Doctor Druid learned of the Fantastic Four's heroic nature. The Shroud and the Law Enforcement Squad later vanished from Earth-616 following Druid and Mr. Fantastic's discovery of the involvement of the cosmic Abraxas. 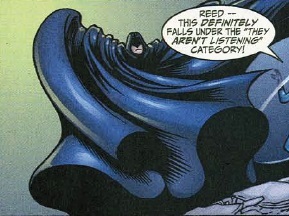 The Shroud possessed the ability to manipulate the Darkforce, similar to his Earth-616 counterpart. 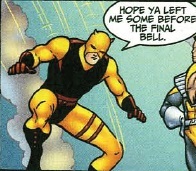 The Whizzer was the same as his Earth-616 counterpart except for his membership in the Law Enforcement Squad. He was transported to Earth-616 alongside his teammates, where he battled the Fantastic Four, focusing his attack on the Human Torch before the alternate reality Nova blasted him. The fight was the Fantastic Four was called off by Doctor Druid shortly thereafter and the Law Enforcement Squad subsequently vanished from Earth-616. The Whizzer had superhuman speed, sufficient enough to batter the fiery Human Torch without getting burned.